If you want a bike that is geared for a mountain adventure then the Trek Slash will do the trick. This bike is composed of an aluminum frame and weighs around 14 kilos. The bike is a bit on the pricier side. 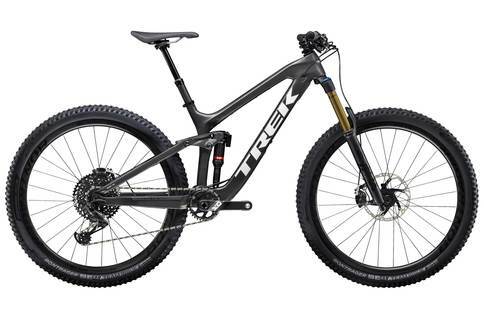 Despite its 14 kilos, the Trek Slash does not really look all that bulky. For the most part, it appears quite streamlined, free of any unnecessary distractions. This is a nice change considering that you do not want to be burdened down out on the trails. Without further ado, we set off on the Trek Slash. True to its appearance, you do not really feel the weight of the Slash. While we were certainly not leaping off the trail, this bike is definitely agile in its own right. What really sets the Slash apart and gives it a leg up on the competition is the suspension. Trek has been right up there with one of the greatest suspensions created and it really shows on the Slash. Regardless of what you hit, it is going to feel like a breeze. We were also pleasantly surprised by how easy it was going up on the inclines. It did not really require much effort all and heading downhill was just as much of a rush. You are also not really compromised when it comes to speed and you will be able to hit the trail with a decent amount of force. All in all, though the Trek Slash is just fun to ride. This is because you just know that this bike is going to be able to put with anything that you might throw at it. When you couple this is with an overall solid frame and good specs, it is definitely for an enduro enthusiast. Plus, when you take all of these features into consideration, the price tag actually seems quite worth it. At the very least, you know that the Slash is going to last you a while. The Trek Slash has everything and more that you need in an enduro bike. It is the perfect companion, out on the trails. The Trek Slash is definitely one of those bikes that are worth the investment. This is because you can be certain of just how much you will be able to get out of it.